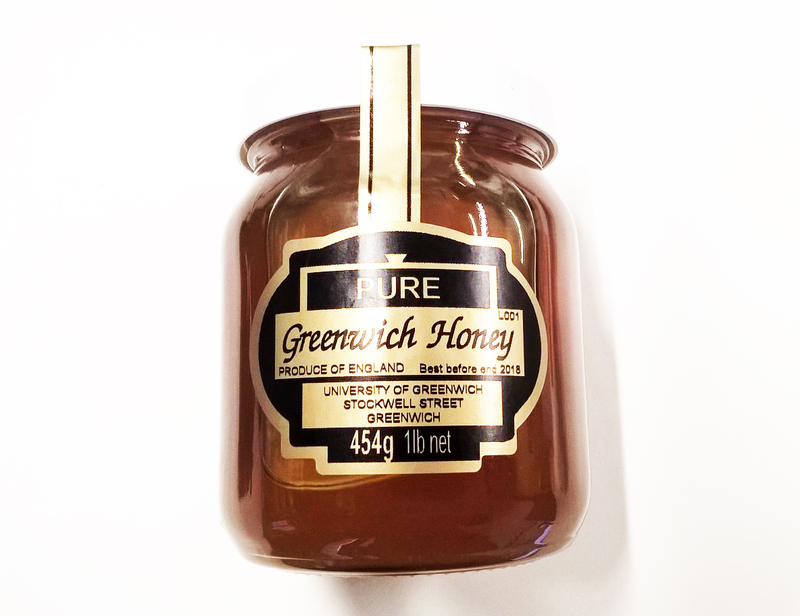 Pure Greenwich honey is for sale today in the Stockwell Street cafe. The honey is from the apiary on the roofs of Stockwell Street, the new University of Greenwich building in London. The building incorporates 14 innovative landscape roofs which create a living laboratory where the sustainability of new ideas in landscape architecture are tested. The 14 different landscape roofs, equivalent in size to 12 tennis courts, include environments and ‘climates’ for teaching, learning and research, via various living laboratories – there is a wetland, climate controlled greenhouses, an apiary of bees, a vegetable grid for research into food cultivation, arid planting and herbaceous landscapes. 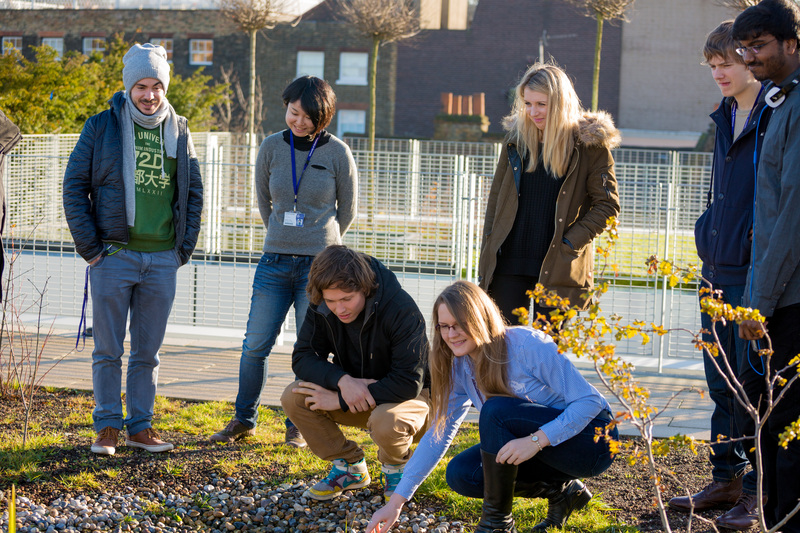 The landscape roofs have been awarded a BREEAM Innovation credit for their teaching, learning and research innovation with 14 various landscapes in one location. Together they form the UK’s leading teaching, learning and research innovated roof top landscapes. They are among the largest multi-functional landscape roofs anywhere in the world. The roofs include outdoor classrooms as well as areas for testing plants, soil types and irrigation regimes. The Stockwell Street landscape roofs fosters research into urban farming, biofuels, innovative façade materials and water management as well as the study of living walls and green roofs. Staff and students cultivate vegetables, fruit trees and soft fruit bushes as well as many other plant types in an array of outdoor planting areas and in the especially designed, climatically controlled greenhouse. 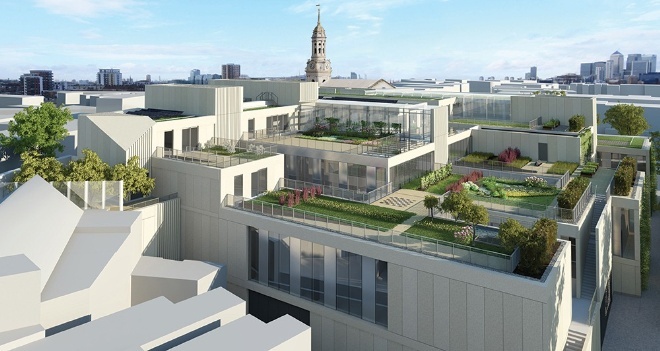 With two large water features, the roofs have also been designed to benefit local wildlife and biodiversity. The bee hives produce local Greenwich honey on one of the roofs. The roof is also home to an innovative research algaeponics unit; algaeponics being the ground-breaking process by which sunlight and carbon dioxide interact with methane emitted from algae to create zero-carbon fuel. The Greenwich algaeponics unit isthe first permanent algaeponics installation in the UK and one of only a handful across the world. This Algae will be used as fertilizer to feed the landscape roofs. To know more about the roofs or to study with us, get in touch.